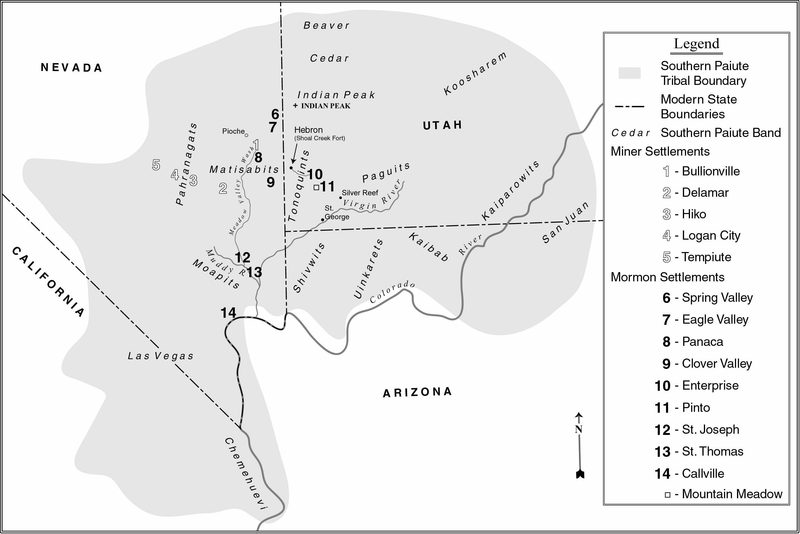 The Southern Paiute people is a tribe of Native Americans that have lived in the Colorado River basin of southern Nevada, northern Arizona, and southern Utah. Bands of Southern Paiute live in scattered locations throughout this territory and have been granted federal recognition on several reservations. The first European contact with the Southern Paiute occurred in 1776, when fathers Silvestre Vélez de Escalante and Francisco Atanasio Domínguez encountered them during an attempt to find an overland route to the missions of California. They noted that some of the Southern Paiute men "had thick beards and were thought to look more in appearance like Spanish men than native Americans". [a] Before this date, the Southern Paiute suffered slave raids by the Navajo and the Ute. The arrival of Spanish and later Euro-American explorers into their territory increased slave raiding by other tribes. In 1851, Mormon settlers strategically occupied Paiute water sources, which created a dependency relationship. But, the presence of Mormon settlers soon ended the slave raids, and relations between the Paiutes and the Mormons were basically peaceful. The Mormon missionary Jacob Hamblin worked at diplomatic efforts. The introduction of European settlers and agricultural practices (most especially large herds of cattle) made it difficult for the Southern Paiute to continue their traditional lifestyle, as it drove away the game and reduced their ability to hunt, as well as to gather natural foods. Today Southern Paiute communities are located at Las Vegas, Pahrump, and Moapa, in Nevada; Cedar City, Kanosh, Koosharem, Shivwits, and Indian Peaks, in Utah; at Kaibab and Willow Springs, in Arizona. Due to the policies, treaties, and mistreatment experienced by the Southern Paiute, their history is that of tragedy, dependency, and portrays the consequences of US paternalistic policy towards Native American tribes. Yet through it all the Southern Paiutes have portrayed remarkable resilience in preserving their culture, religion, and pride. Even though they've been marginalized and almost decimated from the world population, they managed to make a remarkable retaliation, preserving their priceless culture and heritage. Prior to the 1850s the Paiute people lived relatively peacefully with the other Native American groups. These groups included the Navajo, Ute, and Hopi tribes. Though there was the occasional tension and violent outbreaks between the two groups, Paiutes were mainly able to live in peace with other tribes and settlers due to their loose social structure. Most Paiutes lived in small familial groups, and only gathered together in large settings for matters of trade and commerce. Prior to the 1850s their biggest antagonist raiders from competing tribes; such as the Navajos, Utes, and Hopis. The Navajos were particularly notorious for intruding on Paiute grazing land and engaging in brutal raids to capture Paiute women and children for slave trade. Though these raids were harmful, what really crippled the Paiute's was the “settling” of their tribal lands by US citizens. The most prominent groups to migrate to Paiute lands were members and missionaries from The Church of Jesus Christ of Latter Day Saints and silver miners in Pioche, Nevada. To the Paiute people the settling of their lands not only brought a clash of economies and culture, but also a "degradation" of their sacred land. Prior to the 1860s there had been no long term development of the land. Most of the non-native contact they had was with transient militants or traders. Paiutes fought hard to defend their ancestral lands, and at first were successful in driving the settlers out. But in 1869, a rich investor by the name of François Louis Alfred Pioche poured out investment in that town and it seemingly grew overnight to be a booming mining town. In the beginning of its founding, this town depended upon cheap Paiute labor to work in the mines. This caused a dramatic decline in the Paiute population. Another problem the Paiute people faced with these permanent settlers was their desire to “Americanize” the Paiute children. Paiute children were mandated to attend American schools where it was attempted to eradicate their old cultural traditions and tendencies. They were forced to learn about US history through the eyes of the US historians; causing them to forget their own culture and changing their historical memories of important coinciding events. The Paiutes, a population of thousands of people, rapidly dwindled to be around sparsely 800 people. Due to forced relocation, disease, and forced assimilation as time went on the Southern Paiute people started to disappear from the history books. In the 1950s the Paiutes fell victim to "Indian termination policy". These policies stripped the Paiutes of their health and educational benefits, federal tax protection, and agricultural assistance. This policy harmed the Paiute people by leaving them on their own in a weak and unstable state. In the 1980s the first attempt of reconciliation was made in the Restoration Act. This act "legally" created the "Paiute Tribe" in the eyes of the US legislator. It united the five main bands into one tribe; the Cedars, Indian Peaks, Kanosh, Koosharem, and Shivwits, and restored them to a system of federal aid and support. including ones to strip fruit off of bushes and trees, ones used for winnowing, and ones used to get to roots better. They would also tightly weave these big baskets with clay and resin to create cooking pots and water jugs. Oftentimes, smaller tools were left behind, whereas bigger products such as cooking pots went with the families as they moved around. Based on the region the families were located determined different uses for the weaving. For instance, those who lived by marshes learned to create duck decoys, nets, and rafts to better hunt the water fowl. Another use for this skill was to create their houses. They would use long thin grasses to tightly weave stalks of Cattails together, and in doing so they created these long board-like sections of grasses that they would set up around long willow limbs stuck in the ground. seeds that would be ground up into meal. Those who lived in a region with an adequate water supply would set up farms, complete with ditch irrigation. The biggest crops were maize, squash and wheat. The men were the primary hunters, they would hunt water fowl, rabbits, bighorn sheep and other mammals in the regions they passed through. One important aspect of gathering food was the social aspect, often families would come together for foraging and games and then depart and go their different ways. The Southern Paiutes weren't actually split up into tribes, oftentimes their groups were made up of small family units that would occasionally come together with others to socialize. You would have about 10-50 people in each group, and in each group everyone was related to each other. Family ties were really important to these groups—it would often determine where they would go and who would support each other—so marriages were very important to the Southern Paiutes. The leader of the group was called a Headman, and he would be old enough to know a lot about the land, but young enough to still participate in the tribes activities, and he usually had several different family ties within the group. His job was to wake early in the morning, and using his knowledge he would make specific suggestions of what he thought the tribe should do that day, and if people thought his observations were astute they would follow him, if not then they wouldn't. His suggestions would be based on the weather, season, and abundance of food. If over time they stopped following his ideas and instead turned to another, then the Headman leader title would move onto that person. The Headman also was supposed to settle any disputes that came up. Oftentimes different sub-units of the Southern Paiutes would be classified by the settlers coming in from Europe based on what they ate. So you had those who ate waada seeds, those who ate trout, those who ate cattails, etc. The Southern Paiute people believe in Puaxant Tuvip, or power land. Its their holy land that links to many significant landmarks in the Southern Paiutes memory and stories. For instance Nuvagantu, or Mt. Charleston in Nevada is a holy landmark that the Southern Paiute people believe was where they were created. These holy lands were places that the separate families or tribes would come to barter, trade, socialize and perform religious ceremonies. Another large landmark that is culturally significant to the Southern Paiutes is the Colorado river and the Grand Canyon. The modern day importance of these Holy Lands is that the Southern Paiutes claim the supernaturally given right to know what happens and the impacts of any projects that occur in their holy lands. series of images that relate to traditional songs and games the Southern Paiutes would play, the arrowheads that they were known for. Overall the image is supposed to represent a warrior's shield with the five eagle feathers hanging on the bottom representing the 5 modern day tribes of the Southern Paiutes. The Southern Paiute traditionally had 16 to 31 subgroups, bands, or tribes. Las Vegas band (Nipakanticimi, Nuaguntits), "People of Charleston Peak"
Moapa (Moapats), "Muddy Creek Paiute"
Shivwits (Sipicimi, Shebits, Sübüts), "People who live in the East"
Uinkaret (Yipinkatiticimi), "People of Mount Trumbull"
^ a b Holt, R. L. (October). Paiute Indians. Retrieved October 12, 2018. ^ Bunte, Pamela; Franklin, Robert (1992). "You Can't Get There from Here: Southern Paiute Testimony as Intercultural Communication". Anthropological Linguistics. 34 (1/4): 19–44. JSTOR 30028366. ^ a b Reeve, W. Paul (2006). "Making Space on the Western Frontier". University of Illinois Press. doi:10.5406/j.ctt1xcnr6 (inactive 2019-03-08). JSTOR 10.5406/j.ctt1xcnr6. ^ Riggs, Christopher K. (2000). "American Indians, Economic Development, and Self-Determination in the 1960s". Pacific Historical Review. 69 (3): 431–463. doi:10.2307/3641716. JSTOR 3641716. 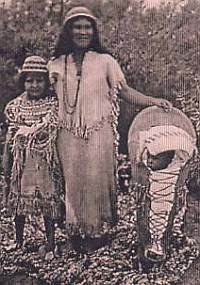 ^ Indian Tribe of Utah: History Utahpaiutes.org. Retrieved 7 January 2019. ^ Holt, Ronald L. “Paiute Indians.” Utah Department of Heritage and Arts, 17 Aug. 2016, heritage.utah.gov/history/uhg-first-peoples-paiute-indians. ^ "Our History - the Paiute Indian Tribe of Utah". ^ a b c Patapoff, E. (Director) (1979). "The Earth is Our Home [Video file]". Kanopy. Retrieved 2018-10-12. ^ a b Cultural Resources Management program (2012). "Rock art of the malheur marshlands the wada'tika: Ancestors of today's burns paiute tribe, oregon". US Fish and Wildlife Service. Retrieved 2018-11-12. ^ Allison, James R.; Meegan, Cathryn M.; Murray, Shawn Sabrina (2008). "Archaeology and Archaeobotany of Southern Paiute Horticulture in the St. George Basin, Southwestern Utah". Kiva. 73 (4): 417–449. doi:10.1179/kiv.2008.73.4.003. JSTOR 30246559. ^ Knack, Martha C. (2004). Boundaries between : the Southern Paiutes, 1775-1995. University of Nebraska Press. pp. 20–25. ISBN 9780803278189. ^ Stoffle, Richard W.; Halmo, David B.; Austin, Diane E. (1997). "Cultural Landscapes and Traditional Cultural Properties: A Southern Paiute View of the Grand Canyon and Colorado River". American Indian Quarterly. 21 (2): 229. doi:10.2307/1185646. ISSN 0095-182X. JSTOR 1185646. ^ Healy, Donald (2008). "Paiute logo and flag information". Paiute Indian Tribe of Utah. ^ a b c d Kelly & Fowler 1986, p. 394. ^ a b c d e f Kelly & Fowler 1986, p. 395. ^ a b c d e f Kelly & Fowler 1986, p. 396. Dominguez, Atanasio; Vélez de Escalante, Silvestre (1776). Derrotero de los Padres Fray Francisco Atanacio Domínguez, and Fr. Silvestre Vélez, de Escalante, en sus exploraciónes, desde las missiones de Zuñy del Nuevo Mexico, hasta las ymmediaciones de Monte Rey de California. Hogan, C. Michael (2008). Burnham, A. (ed.). "Morro Creek – Ancient Village or Settlement in United States in The West". The Megalith Portal. Archived from the original on 24 May 2013. Kelly, Isabel T.; Fowler, Catherine S. (1986). "Southern Paiute". In d'Azevedo, Warren L. (ed.). Handbook of North American Indians. 11 Great Basin. William C. Sturtevant, general editor. Smithsonian Institution. pp. 368–397. ISBN 978-0-16-004581-3. Kroeber, Alfred L. (1925). Handbook of the Indians of California. Bulletin (Smithsonian Institution. Bureau of American Ethnology). 78. Washington, D. C.: Government Printing Office. Pritzker, Barry M. (2000). A Native American Encyclopedia: History, Culture, and Peoples. OUP. ISBN 978-0-19-513877-1. Warner, Ted J., ed. (1995). The Domínguez–Escalante journal : their expedition through Colorado, Utah, Arizona, and New Mexico in 1776. Translated by Chávez, Angélico. foreword by Robert Himmerich y Valencia. University of Utah Press. ISBN 978-0-87480-447-8. Dutton, Bertha Pauline (1976). The Ranchería, Ute, and Southern Paiute Peoples (2nd ed.). Prentice-Hall. ISBN 978-0-13-752923-0. Wikimedia Commons has media related to Paiute. Southern Paiute Collection of Charles Cairns at AILLA—contains audio recordings of words, phrases, and a story in the Southern Paiute language. This page was last edited on 20 April 2019, at 02:17 (UTC).